When you need a quick boost, energy drinks may come in handy but how safe are they? A group of highly caffeinated products known as energy drinks have grown popular with teenagers and young adults. These drinks are sometimes sold as “nutritional supplements” or marketed to help concentration, weight loss, increase energy, stamina and metabolism. Attraction to these beverages results from professional product marketing, influence by friends and lack of knowledge about their negative effects. Several reports by experts have revealed that the high amounts of caffeine in these energy drinks can mess with your heart. Cardiac complications such as abnormal heart rhythms (arrhythmias) and raised blood pressure have been reported in different studies. This new report, which is a case study, provides evidence that these changes can cause serious problems and even sudden cardiac death. The energy drinker is a 28-year-old man who was sent to the emergency room due to arrhythmia (an irregular heartbeat) and vomiting with blood. The patient had a heart-rate of 130 beats per minute which is very fast and he was suffering from an abnormal heart rhythm known as atrial fibrillation. This disorder is a common type of arrhythmia and if it continues can result in severe problems. The patient said that every day he had two Monster energy drinks –these contain 320 milligrams of caffeine. An endoscopy showed a tear of the esophagus and stomach, possibly due to forceful vomiting. This is an illustration of the effect of a high volume intake of energy drinks. They point out that the caffeine level in a Monster energy drink is 160 mg, about four times more than most caffeinated soft drinks. 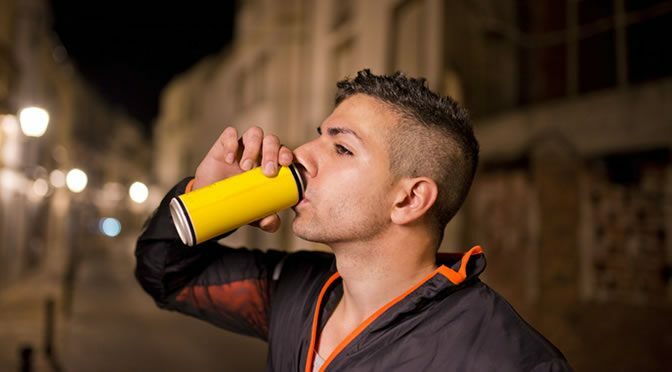 Medical research reviews have shown more cases of cardiovascular events associated with energy drinks such as Red Bull or Monster. Besides high levels of caffeine, several mechanisms could cause cardiovascular events. These beverages contain other ingredients such as taurine, which might increase the effects of caffeine. Using energy drinks along with high amounts of stress, alcohol or illegal drugs can also increase the chance of abnormal heart events. The study was published in Journal of Addiction Medicine (Sattari et al., 2016).